Peacock posture induces tranquility in the heart and builds your inner strength. By activating the Heart Meridian, which begins from the heart and ends at the inner tip of the little finger, practice of Peacock posture can slow the heart rate and lower blood pressure. MBX 5: Peacock Posture by Sang H. Kim, activating the Heart Meridian. From natural stance, place your heels outward and bend your knees. Overlap your palms in front of the lower abdomen with the fingers pointing downward. Exhale. Inhaling, bring your hands up to chest level with both palms pressing against each other. Inhaling further, toss both hands to the top edges of the shoulders. At this time, keep your hands like bird beaks. Press the thumb, index, and middle finger against each other, pointing at your biceps. Exhaling, very slowly lower your elbows toward the rib cage, then move your bent hands along the arms. Breathe out through your mouth (with “Hah” sound). Sink your shoulders. When you’ve completed lowering your hands, return to natural stance. 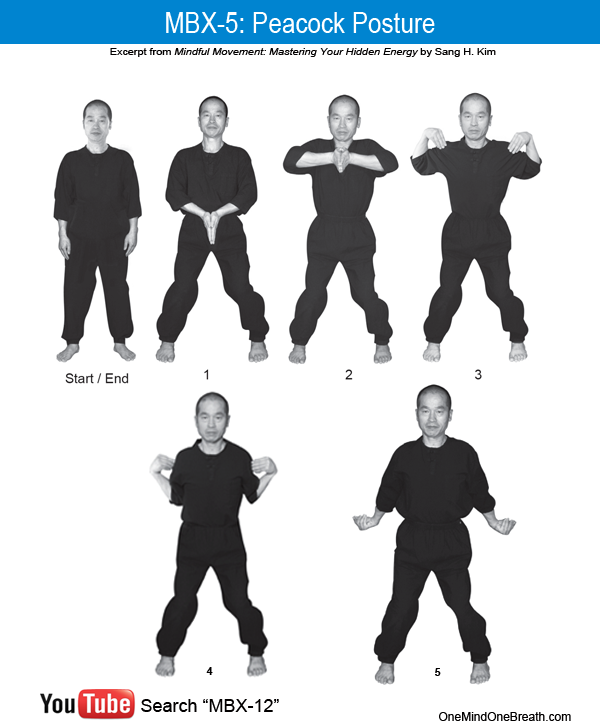 This exercise begins from a calm stable stance, with both hands overlapped in front of the lower energy center (1), which generates a sense of composure. A deep inhalation (2-3) pushes the diaphragm down, producing a feeling of strength and restful alertness. A long exhalation, with slow stretching of the meridian from the heart to the little finger (4-5), expands your chest completely. Make your hands like two bird beaks, also introduced as Five Points in MBX-12 workshops, and bend them toward your wrists as tightly as you can. When you lower them very slowly, from the top of your shoulders to the sides of the hips, you will feel the intensity of your inner energy built up in the body. This entry was posted in MBX-12 Workshop, MBX12, Mindful Movement and tagged Blood Pressure, Deep Breathing, Emotion, Energy, Equanimity, Exhalation, Heart Meridian, Inner Strength, MBX-5, Peacock Posture, Sang H. Kim, Tranquility. Bookmark the permalink.